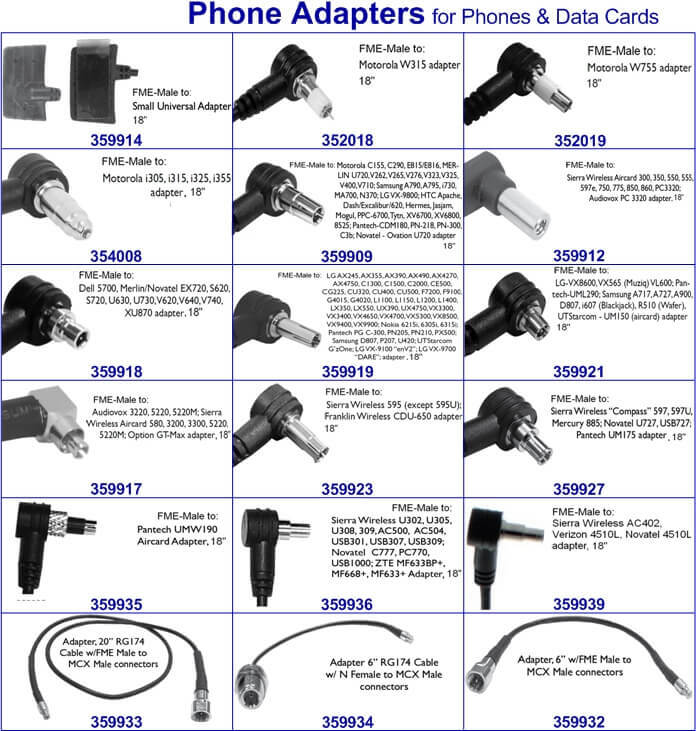 Adapters for phones or data cards are legacy products in the field of cellular signal boosting solutions. Despite the age of these products, they are becoming increasingly valuable in terms of applications. These adapters connect an amplifier or outside antenna directly to a port on a phone or data card (could be the antenna RF port or a separate port on the device). 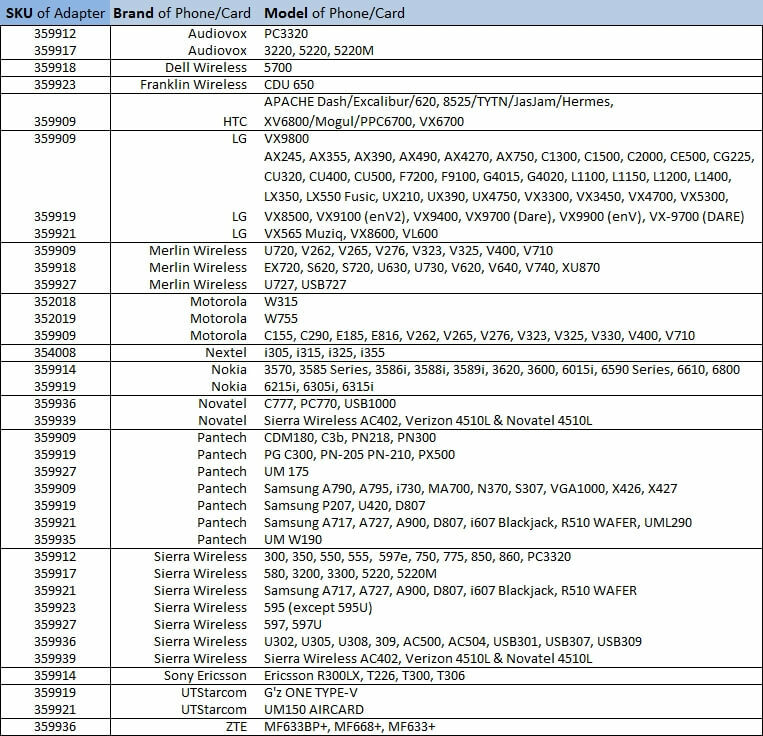 There are many antenna adapters available for the many different propriety ports on older devices. There is also an antenna adapter designed to connect the MobilePro (801240) to the Cradle Plus (301146) turning the popular wireless amplifier into a cellular signal boosting solution which transmits the boosted signal to a device which is docked onto the cradle. Most of these adapters have an 18 inch cable which includes one end to connect to the propriety jack and the other end which includes an FME connector. Connecting phone/device directly to outside antenna essentially replaces the small antenna included with the device with a much larger antenna. This allows for a much stronger signal gain for a compatible data card or phone. In terms of cellular signal boosting, this is the most affordable and most basic way to obtain a superior signal. Since there is no amplification of the signal, it is not designed for areas of very poor signal but more for a weak signal which is caused by obstructions. Connecting phone/device to amplifier unit directly links the two critical component together maximizing the potential of the amplifier system. Since there is a physical wired connection, the enhanced signal is transmitted directly to the device. This does make any amplifier a single-user device. The amplifier will still require an outside antenna and cables to connect the two together and provide power. There is also an adapter to directly connect the MobilePro to Cradle Plus. This adapter is included with the Cradle Plus and plugs directly into a special port on the amplifier. The MobilePro is a wireless amplifier with built-in inside antenna but this solution allows for it to become a cradle booster. As a result, it would be a single-user solution which will see a stronger boost in cellular signal for a device placed in the cradle.